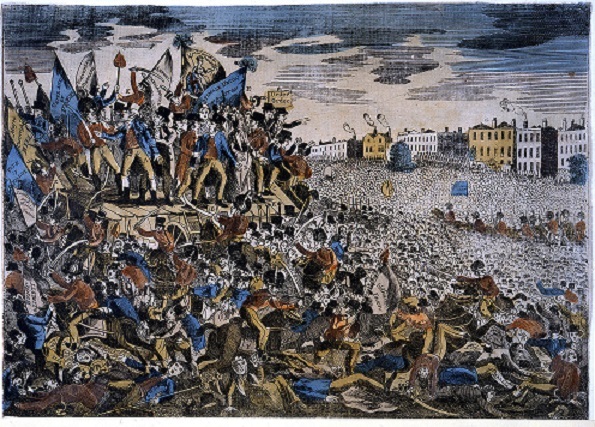 The Peterloo Massacre was a deadly event in the history of Manchester. On 16 August 1819, cavalry charged into the crowd containing 60,000 to 80,000 men, women, and children who had gathered on St Peter’s Field in Manchester, England, to demand the reform on a various degree, primarily of parliamentary representation. The name given to the massacre at St. Peter’s Field was to attach it to the iconic The Battle of Waterloo. Who was to Blame for the Peterloo Massacre? Who Died in the Peterloo Massacre? In 1815, at the end of the Napoleonic wars, a famine was widespread due to inflation, population imbalance, crop failure, food scarcity and change in the government policies. This was exacerbated by the imposed Corn Laws in Britain. A brief boom in textile manufacture and industrial revolutions, followed by a period of economic depression. The weavers and workers in the factories were paid one-third wage of what they might have received. The cost of food rose and people were forced to buy lower quality and more expensive British grown grain and other material. This caused great unemployment and ensued the desire for political reform in Lancashire and in the country at large. Due to the industrial revolution, the mass of workers with their families shifted to the mainland where factories were established. This changes left the countryside with very few people with their sheep and cattle. Voting was restricted to the male where women had no right to vote in the election process. The constitutional boundaries across the nation were outdated and required to be updated with the shift in population. However, these all reasons were ignored, which left the Member of Parliament representing a very few people and leaving a mass of voice unattended for the parliamentary system. The major urban cities such as Manchester, Bolton, Salford, Rockdale, Blackburn, and Stockport with a combined population of over a million, were represented by two MPs for Lancashire or the two MPs for Cheshire. This political inequality led to call for reform in the parliamentary system. There were peaceful gathering in early 1817 and in July 1819 to address the ongoing poor economic condition and appeal of political reform to the government. People gathered at St Peter’s field to hear the radical orator Henry Hunt. The meeting was organized by the Manchester Patriotic Union. The union was formed by radical from the Manchester Observer newspaper, whose founder Joseph Johnson asked Henry Hunt to char the meeting planned for 2nd August. This meeting was postponed to 9th August and later banned by magistrates to discourage the radicals. However, Hunt and his followers were determined for the meeting and organized a peaceful gathering on 16th August at St. Peter’s field. The crowd arrived in disciplined and organized contingents, comprising people from Royton, Crompton, Less, Saddleworth, Oldham, and Mossley. Each group was carrying a flag with them. Most of the crowd was containing women and children. At around 1:00 pm, Hunt’s carriage arrived, and the atmosphere was charged with energy though in a peaceful manner. However, seeing the crowd and enthusiastic reception that Hunt received, the chairman of the magistrate William Hulton who was watching the gathering from his house window, encouraged him to issue an arrest warrant for Henry Hunt, John Knight, Joseph Johnson, and James Moorhouse. Hulton wrote two letters, one to Major Thomas Trafford, of the Manchester and Salford Yeomanry Cavalry. The other letter he wrote to the Lieutenant Colonel Guy L’Estrange, an overall military commander in Manchester. He ordered to proceed to no.6 Mount Street for the immediate arrest of Henry Hunt and its supports. Sixty cavalrymen and other officers came at the ground of gathering, and started drawing their swords right and left, splitting the flags which crowd was carrying. This deadly act killed more than 15 people including women and left around six hundred people injured. Within ten minutes, the crowd was dispersed, leaving only wounded, their helpers and dead. The massacre was followed by a number of riots in the streets of Manchester, Stockport, and Macclesfield. There was a riot in the city of Oldham on the next day in which one person was shot and wounded by the military. By Mid-1820, most of the radical reformist was jailed on the sedition charges. The authority ordered police and courts to go after presses, publications, and journalist. Manchester Observer founder was arrested and jailed for twelve months. The newspaper was closed in February 1820. On March 1820, Hunt and his eight followers were charged with sedition. Hunt was jailed for 30 months. The others were sentenced from one year to two years of jail term. The government openly declared its support for the actions taken by the army and magistrate. By late 1820, it had introduced new legislation, later known as the Six Acts. The acts were to suppress radical meeting and publications. Any gathering above 50 people in the public place or the church had to take the written permission from the magistrate, which was mostly rejected by the authority. There were numbers of eyewitnesses who described the scene in magazines, books and other publications of the time. Well-known painters tried to capture the image and scene at the site in a number of paintings. Few of these paintings are showcased in museums across the United Kingdom and worldwide. 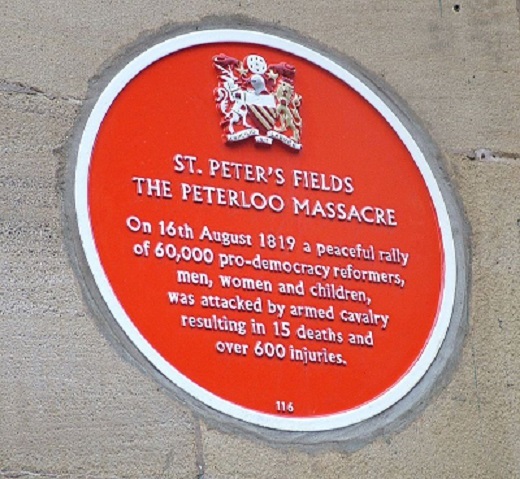 The Peterloo Memorial Campaign Group was established in 2007 which has been lobbying for a memorial of the Peterloo Massacre for a long time. The tagline for the campaign is ‘Respectful, Informative, Permanent’ R.I.P Memorial to this major incident in the history of Manchester and its people. The planned memorial is designed by artist Jeremy Deller which was unveiled in November 2018. Manchester City Council and the artist are working closely to ensure the timely delivery of the monument. It is planned to open the memorial on the 200th anniversary of the deadly incident which is sited close to the site of the massacre. Currently, a plaque mentioning the scale of the incident and casualty happened in the massacre, close to the site where the meeting gathered. The massacre is portrayed on screen in the form of a film, by famous director Mike Leigh. The film was first shown in the BFI London Film Festival in Manchester on 17 October 2018. The film was officially released in the United Kingdom on 2 November 2018, and later on 5 April 2019 in the United States.